Another sneak peek at the November menu with three more dishes to lure you in. I never believed in love at first sight until I first made my beetroot-cured salmon. Call me shallow if you like, but I fell for the colours in this fish even before I had my first bite. Of course, the colour is much more than just skin deep. I’m not only talking about how the beetroot cure seeping slowly into the flesh of the salmon leaves every opalescent slice with a crimson aura that fades into the salmon pink like a sunset over the sea. No – almost every ingredient in that we add to this salmon is marked by its relationship to a colour. The beetroot, infamous for its vibrant stain, is matched with zest of an orange – the fruit that takes such bold pride in its hue that they named the shade after it. The cure -BROWN sugar, BLACK peppercorns. (The dill, fresh and bright and grass-green though it may be, may be the exception that proves the rule). But there’s wisdom behind this beauty as well. The classic pairing of smoke and cured salmon is adored for its peaty darkness – the earthy, fruity flavour of the beetroot combines to similar effect. The orange provides the indispensable citric squeeze for the salmon. It’s a riot of colour both on the plate and behind the scenes. The first bite is with the eyes, but a whole feast that lies beyond that. It’s something special, any way that you slice it. It took about as long for us to come up for a name of this dish as it does to make it (about four hours) although that’s only about twenty minutes of active work, then just a lot of sitting around while things simmer down. It was difficult – exhaustingly difficult – to pick a name for a dish that evokes deep, rich flavour and romance. In the spirit of the Ratatouille Confit Byaldi we mixed languages and ended up with something whose polyglot translation technically means “savoury peasant”, and we thought that was about right for evoking the simple yet intensely flavoursome qualities of this root vegetable stew so long as one doesn’t take the name too literally. Umami Paysan came out of my goal to create the “meatiest” vegetarian dish that I could make. Caramelised onions, well-roasted parsnips and a long, dark cooking time were the key elements to reduce and concentrate all the savoury flavours. 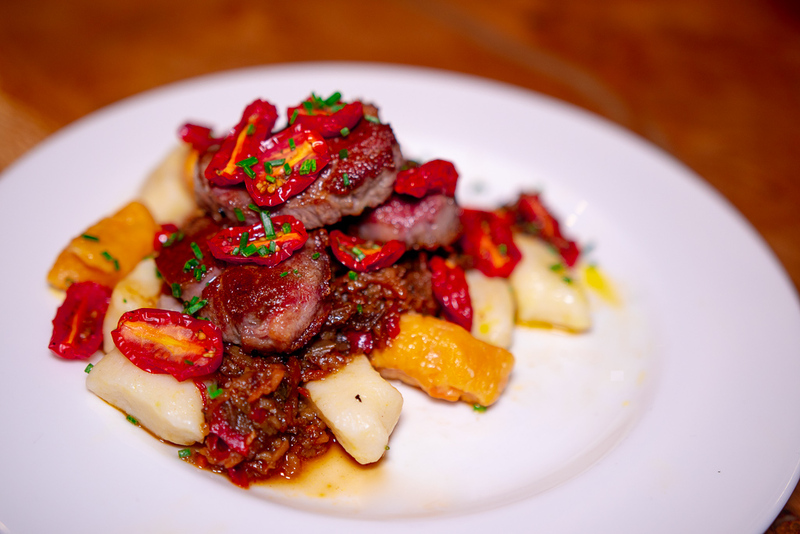 This November, I’m serving it with a variety of different gnocchi (sweet potato, pumpkin, celeriac) and a choice of either a medley of wild mushrooms or lamb neck. There are other custard tarts. There is this one. The pastry is made of chocolate. Not WITH chocolate – OF chocolate – leftover pastry and biscuit crumbs are glued together with melted dark chocolate and smushed into the shape of a tart case before being chilled. The custard is infused with a decadent, rich, sticky-sweet-and-savoury salt caramel. Not some mere hint of toffee and sea, this is a tie-you-up-and-drown-you hit of the magic stuff. Over the course of an hour in a very low oven it takes on an unctuous, tacky, creamy set. The top of the tart is scattered with muscovado and blowtorched until it crisps and crackles and snaps like paper glass. The sugar blackens and burns and cracks in the blast of butane heat. Serve it with nothing. Nothing is good enough. The November menu starts next weekend and runs til Saturday November 24th. Look out for December and 2019 events to be announced shortly – including the Smoke and Thyme Alternative Xmas Party dates.